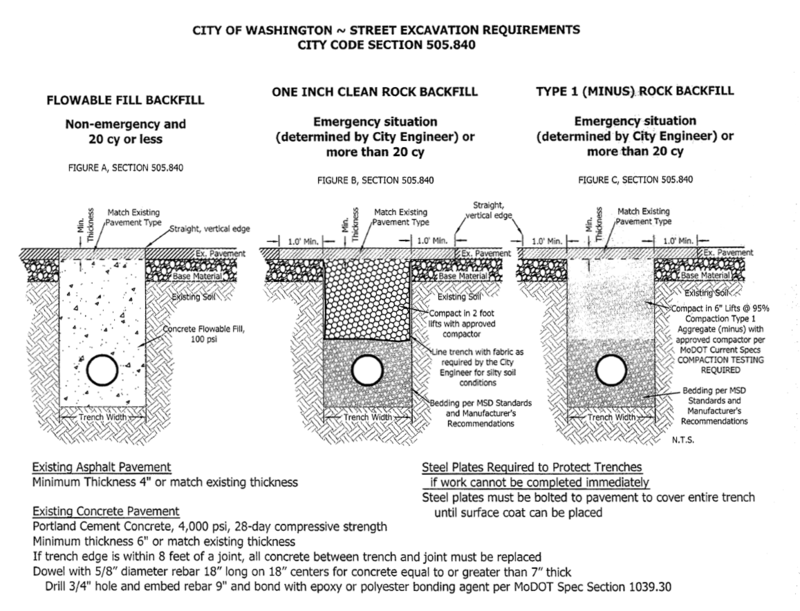 A Street Excavation Permit is required for all work in City right-of-way including sidewalks, streets, curbs and gutter, and associated driveways. View requirements and drawings below. A Street Excavation Permit is required for all work in city right of way including sidewalks, streets, curbs & gutter, and associated driveways. Schedule a meeting with the City Engineer or his representative in the field to determine the scope of work. Fill out a street excavation permit and pay the deposit and inspection fee (a building permit is also required for a sewer-line-repair). These permits can be picked up in our office or found on our website at washmo.gov. Schedule your work with the City representative and keep them updated of your schedule or any changes. 4, Notify the City Engineer or his representative when construction activities occur so that proper inspections may be done. Failure to provide such notification may result in the work not being accepted and the forfeiture of your deposit, your deposit will be returned 6 months after your application upon final inspection approval. Note: If a permit is not acquired a fine and/or penalty may be assessed.